I found some very cool plants on my recent travels. 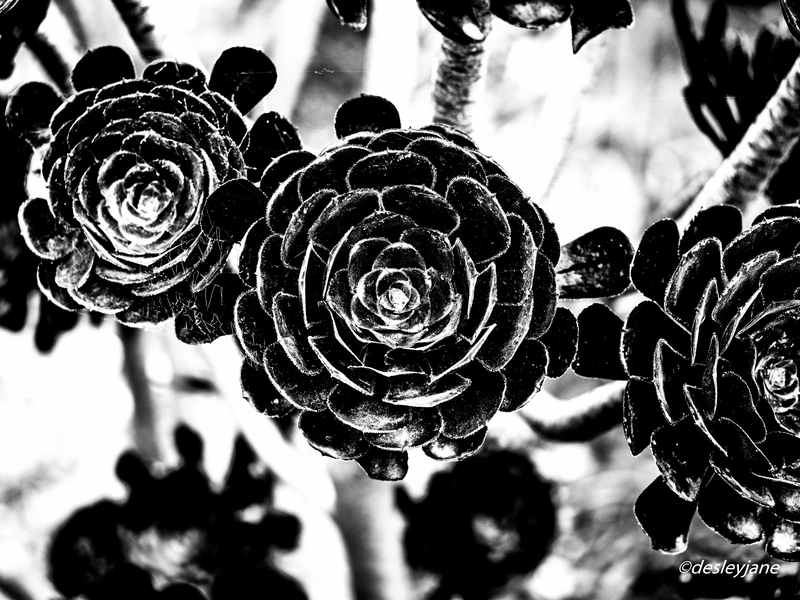 My header image is shown in colour in the gallery below – it’s a very cool dark dark purple colour. It’s an amazing succulent, but I couldn’t find anyone to tell me what it is. The header image, I was trying some new editing. I converted to black and white and really upped the contrast and clarity and whites – I really wanted to show them as dark and gritty and sharp. In the spot where we photographed the koalas, I found the same plant, but green, so I’ve included some shots of those in the gallery as well. I add these photos to Lucile’s Photo101 Rehab Clinic – come on over to enjoy some cool photos and share yours as well. If anyone knows what plants they are, please let me know, they will make a great addition to my rock garden! Have you been to another planet? These are intergalactic flowers, may be cyborgs. Wow, and what effect you created. I love what you did. Perfect composition, framing, boukeh, contrast…everything. Amazing. Kudos, ma frienda. What’s the name? Have you not created them in a lab? Ps. I replied to your email. I don’t know. I have to ask my guy. Thanks hun, will check in tomorrow. Sorry, was at intermission at Wicked when I responded earlier. I have no idea what it is, however, I’m convinced that my ex-in-laws have this in their garden. So I incline to believe that it’s an extraterrestrial plant that is taking over the earth! Thank you so much. Yes I like the contrast in b&w. I’m sure you have some wonderful flowers in Panama! OMG you’re the best. I want to get one now for my terrace. Fab. Checking your post now.